I’m one of those people who actually enjoys cleaning. I find it relaxing for some reason. I love how a clean home looks and feels. One of the perks is to not have to worry about unexpected company dropping over to find a mess. I’m not alone in my cleaning bliss. According to a survey of Canadians by Vileda, 61% of Canadians enjoy cleaning and love a spotless home and spend an average of 2.6 hours every week cleaning up. That sounds about right to me. If you stay on top of things, you’ll have less cleaning to do each week! Though I tidy up every day, I devote one day a week as my “deep cleaning day” and it’s typically on the weekend when I have more time. I’ll wash the bedding, clean and disinfect the bathroom and mop the floors. If I’m being entirely honest here, mopping the floors isn’t my favourite cleaning task to do. It takes the most time and is the most physically taxing. 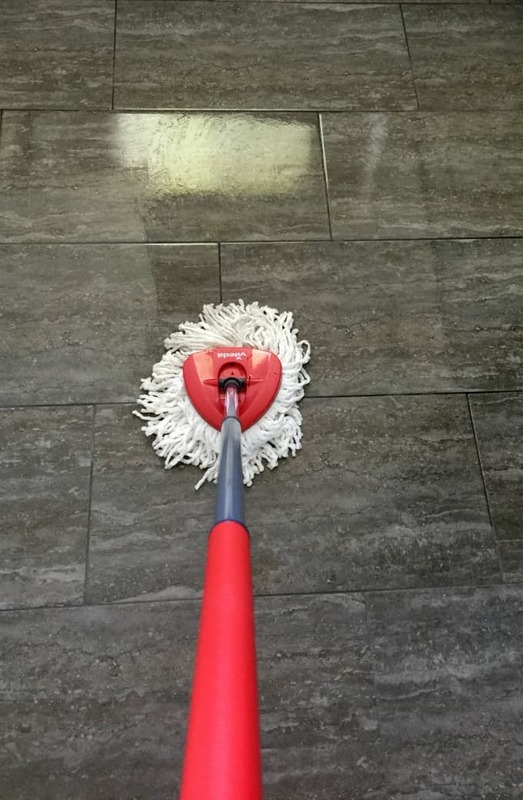 I’ve recently discovered a better way to mop your floors. In fact, by using this system, cleaning floors is pretty darn easy! 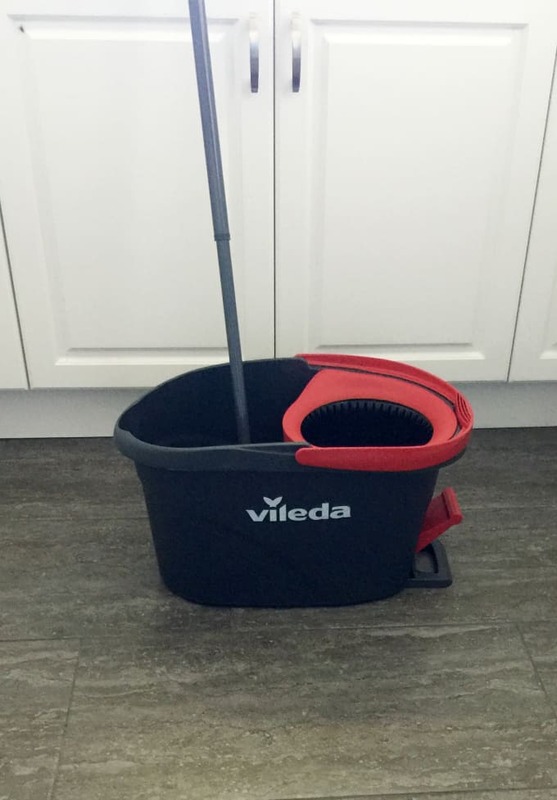 The Vileda EasyWring Spin Mop & Bucket System is my solution to spotless floors and the process is, dare I say, enjoyable!? 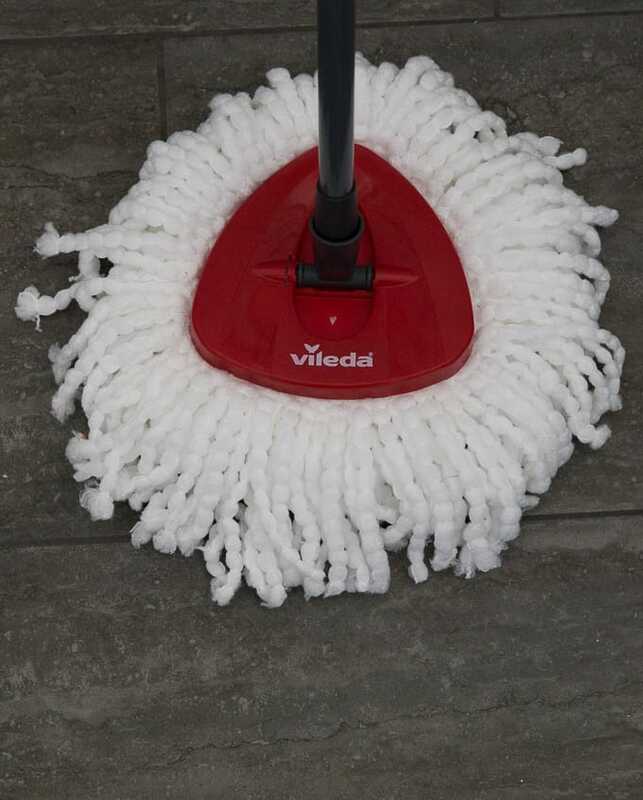 I can easily see why it’s the #1 spin mop in Canada and I don’t know why it took me so long to try it out. Better late than never, I guess! Now that I have one, I’ll never go back to my old way of mopping floors. The microfibre mop is perfect for deep cleaning to get a floor squeaky clean. The microfibres grab up all the dirt like a magnet. You’ll notice its triangular shaped head – it allows it to get into those tough hard to reach spots like corners. I love not having to get down on my hands and knees to scrub my floors! The microfibre pad is machine washable up to 10 times and after that, you can buy a refill to replace it. I love that it’s budget and environmentally friendly. The adjustable telescopic handle also pivots so you can easily reach under furniture. I didn’t even bother to move my kitchen chairs because the mop easily maneuvers around them. I think the coolest feature is the hands-free wringing system. It’s nice to not have to push and push to get the water out. The bucket does all the work for you. It has a foot pedal that you press to start the spinning. 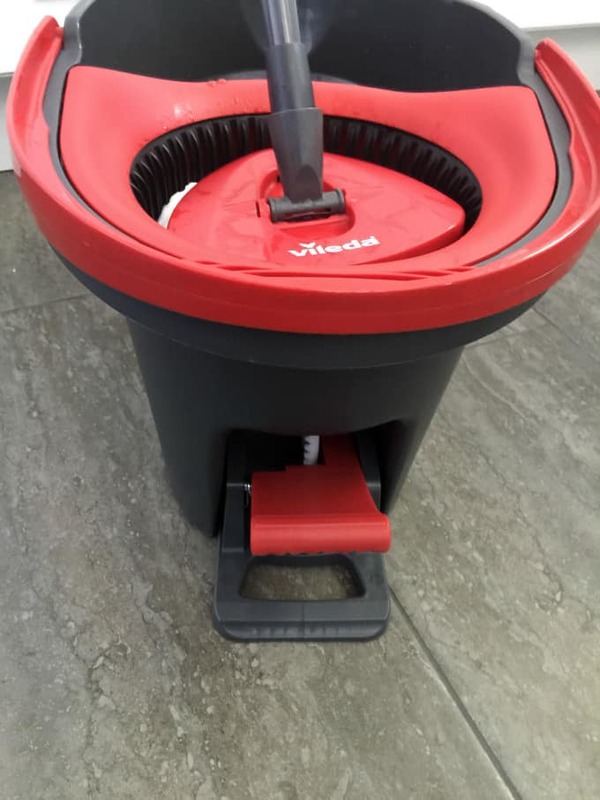 Place the wet mop in the wringer and push down with your foot. You can control how much moisture you want by continuing to press on the foot pedal. I took a quick video to show you how it works. Isn’t it cool? No more sopping, wet floors that take forever to dry. Did you notice that there was no splashing? It has an anti-splash guard that prevents water from splashing while you are wringing out your mop. One thing I noticed is that I never had to bend down to clean my floors. I have a bad back so that’s one of the reasons I dreaded cleaning the floors before. The handle adjusts to the perfect height for me (from 85 to 130 cm) so I can find the most comfortable position. If John were to mop the floor (I wish! ), he could adjust it for his taller frame. I used it on a variety of floor surfaces in my home including my kitchen (porcelain tiles), bathroom (ceramic tiles), bedrooms (laminate) and living room (hardwood floors). It’s versatile and can be used on a variety of hard floor types! I washed the entire top floor of my home in record time. It also dried much faster because I didn’t have all that excess water that I usually have. 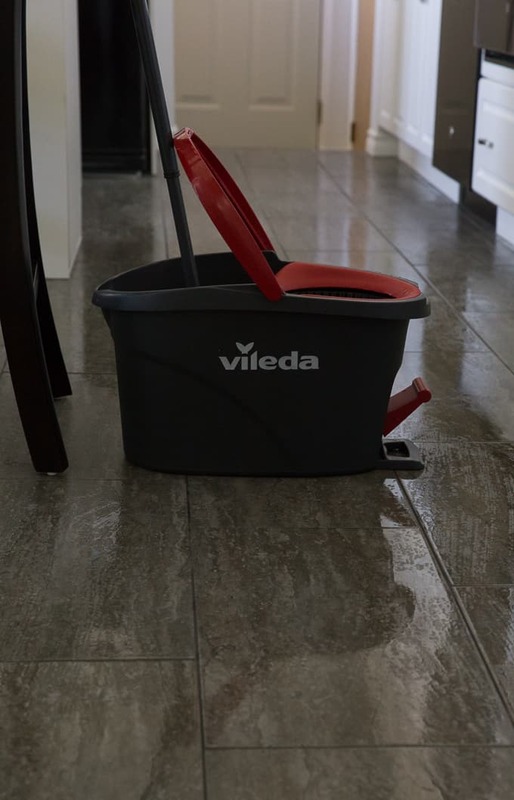 If you are looking for an easier, better way to clean your floors, you need to try the Vileda EasyWring Spin Mop & Bucket System. Watch for an insert in your local newspaper in the coming week featuring money saving coupons on the EasyWring Spin Mop & Bucket System and the refill. You can also save money with these two digital coupons: save $5 on EasyWring and $2 on the refill. Are you looking for an easier way to clean your floors? Connect with Vileda Canada on Facebook, Instagram and YouTube. Disclosure: I was compensated for this post. All opinions are 100% my own. Audible is Now Available to Canadians! Is versatile. Can clean a variety of surfaces. Not having to bend down to clean the floors! I’m getting old, ha ha! I like the triangular shaped head of the microfibre mop. Great for getting into those corners. I like that it has a foot pedal and it looks so easy to use. 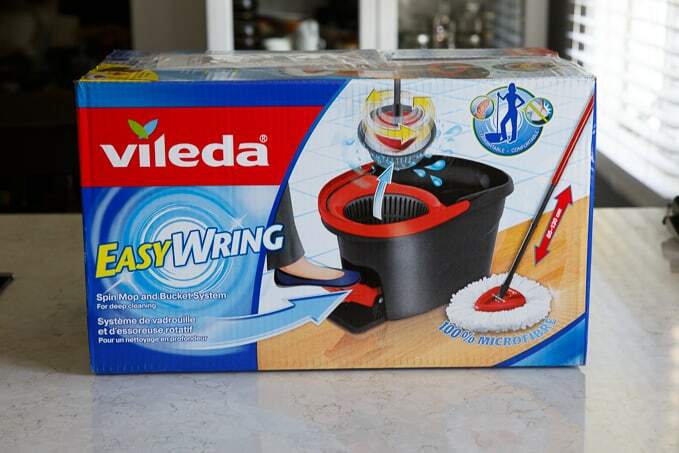 I too have a bad back plus arthritic knees etc – since reading your blog, I am so looking forward to trying out the Vileda Easy Wring Spin Mop! Would love to win this. Have heard nothing but great reviews. I like how easy this looks to use. The foot pedal would be really helpful. I love the happy red colour too! I like everything about this especially the foot pedal! Normally I get down on the floor with an old towel to wash my floors but it is so hard on my knees at this age. I think this product is exactly what I need. Thanks for the chance to win. 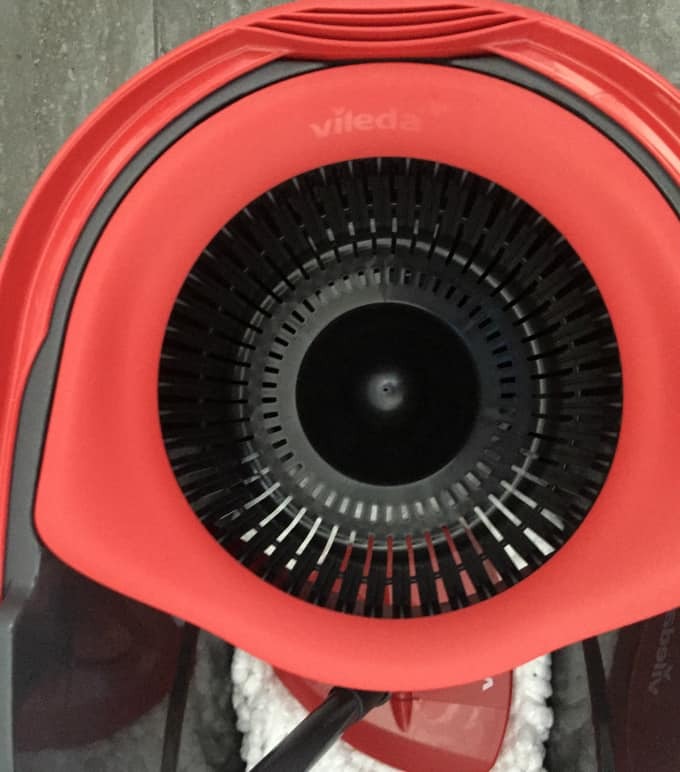 I love the pedal feature on this Vileda mop, which makes life so much easier than having to bend and wring out the mop. 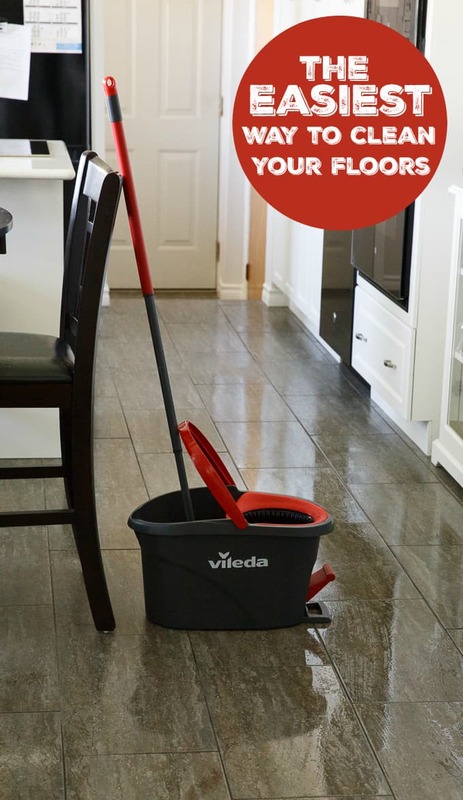 The foot pedal is one of my favourite things about the Vileda EasyWring Spin Mop & Bucket System! I love the foot pedal. It’s back-breaking when I clean, so this would be fantastic! I could definitely use this, between the bad back and different hard floor surfaces in our house! I love that I do not have to bend down and ring the mop out myself! this looks like it would be great, no more bending! I like the adjustable handle. Like that shade of red. I like the triangle-shaped head. It can get into more spaces. I always wanted one. I have severe arthritis and I can’t wash my floors like I used to. Love how easy it looks to use. I love the foot petal! I like how easy it is to use and that there is no bending. 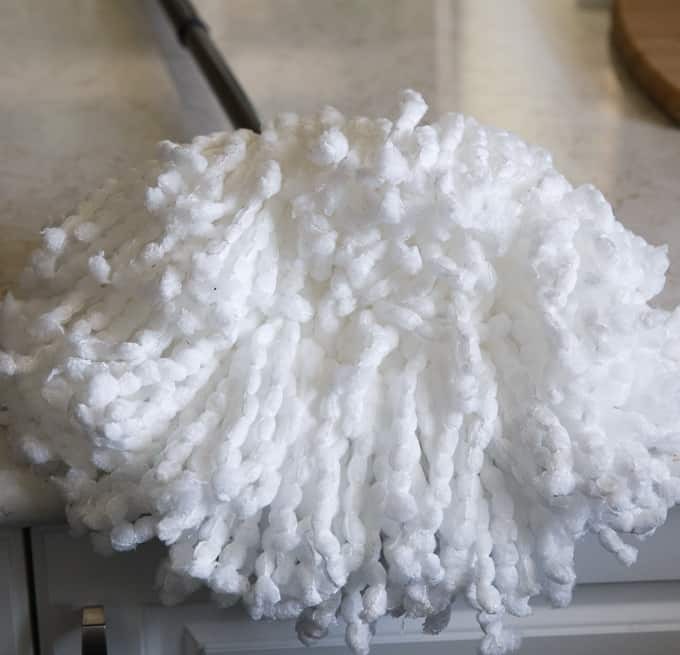 I have heard awesome things about this mop, this would be do much easier on my back! I like the triangle shaped head. With some mops you can’t get the corners and have to do them by hand. I like that is seems easy to use and hat it doesn’t seem like it would be messy!